In recent years, Holland Scherming has been approached increasingly by contractors, architects and building owners in commercial construction. They ask us for our proven techniques in the field of screen systems in horticulture, but in a more refined form to apply in atriums of office buildings, shopping centers and health care facilities. The target here is a (cost) effective and aesthetically pleasing shading solution. Over the last few years, we have responded to this challenge with enthousiasm! The desire to use natural light into a building has led to imposing glass structures and atriums more and more. By applying these large glass roofs, simultaneously a need has arisen to control the access of light and radiant heat. 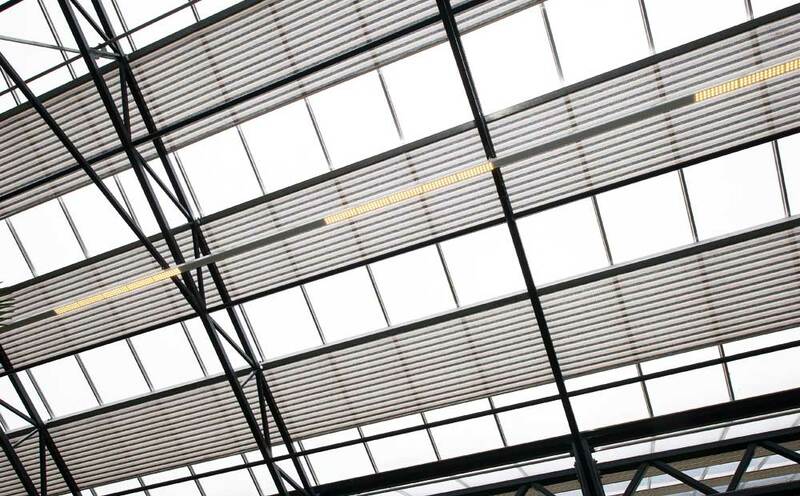 Whether it’s a new or existing construction, a flat skylight, a shed roof or even a curved roof, the engineers of Holland Scherming devise a solution that fits aesthetically in the atrium in your building. We have the knowledge and experience needed to install screen systems on high and hard to reach places. 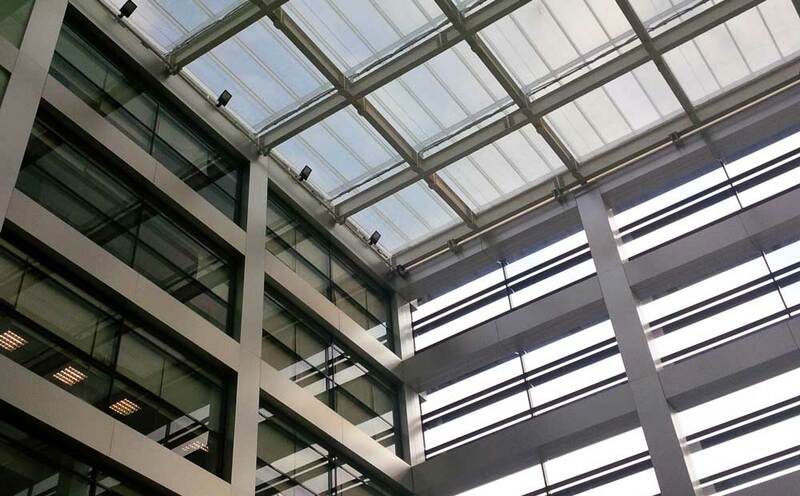 The choice of the screen system for an atrium or other space with a glass roof can be very determinative for the climate in the building. Holland Scherming offers a calculation module that calculates the final light and heat transmission (LTA and ZTA–values). This enables a prior forecast, predicting the contribution of the screen system in addition to the total climate control system in the building. Indoor shading provides a considerable reduction of the heat building up as a result of irradiation. Indoor shading is, compared to an outdoor system, less susceptible to wear by the weather. With a screen system by Holland Scherming you choose for ease of use as well: it can be integrated with the climate control system, making operation fully automated. 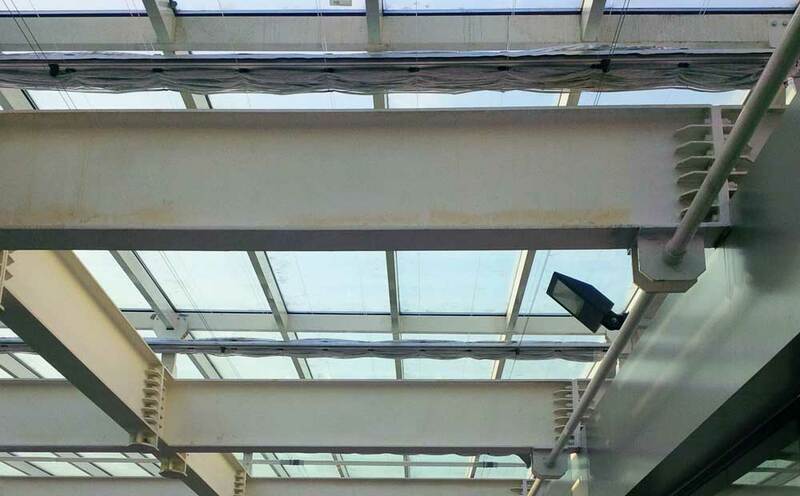 One of the principles of a screen system for atriums is, that the screen and the actuator disrupt in a minimum way in the overall construction of the building. 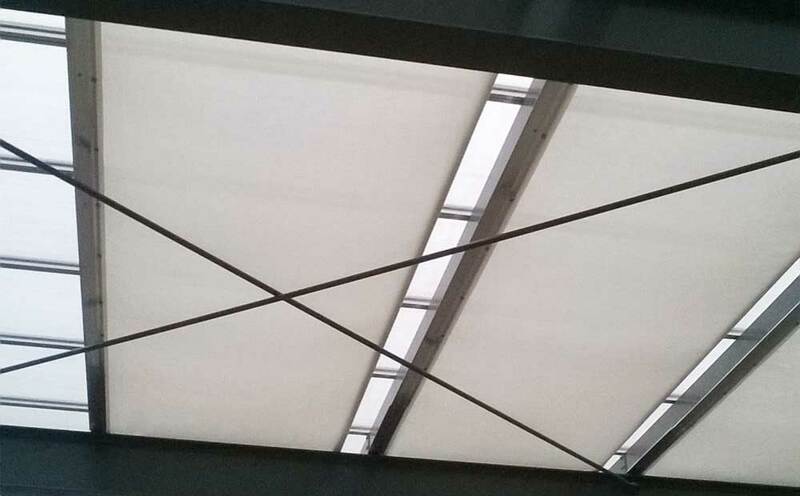 Besides, the color of the screen cloth significantly contributes to the atmosphere: a closed screen system, equipped with the right colour of cloth, adds up to a pleasant, warm atmosphere to the area. Would you like to know more about the posibilities of a screen system in your atrium? Call or mail us now! 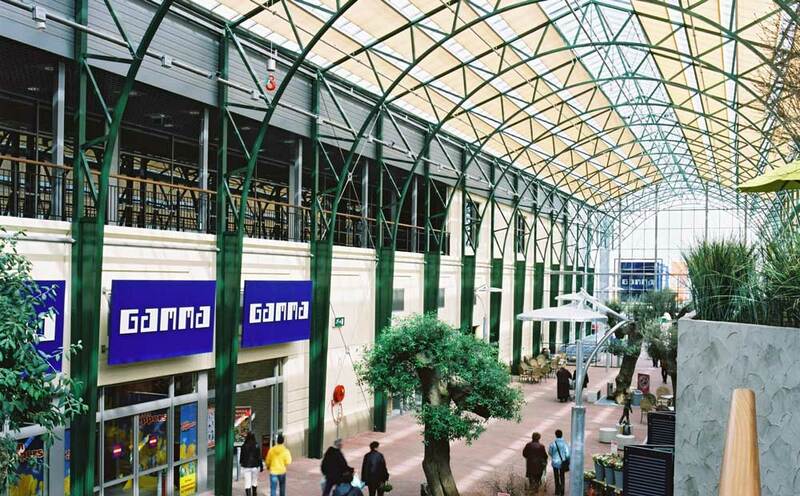 A glass facade or atrium in an office building, shopping mall or institution is not always easily accessible. Therefore Holland Scherming‘s screen systems are equipped with components that have a heavy capacity and long service life. The chance of corrective maintenance is thus minimized and the intervals for pre-emptive maintenance can be extended considerably. A safe environment for humans is always important, but in public places this aspect deserves extra attention. When you choose a screen system with a high aesthetic value that also ensures a pleasant indoor climate, you do not want to worry about fire safety. Our screen systems meet the legal requirements regarding fire protection (DIN EN 13501-1 / NTA 8825-2010). The system will be delivered in accordance with CE standards. Thank you very much for your quote request!